Nestled in the Himalayas, at Earth’s highest elevations, lies Tibet. For many outside observers, it is a land of great spiritual tradition, vibrant color, and a culture uniquely and defiantly different than the Chinese government with which it often clashes. One of the great expressions of Tibetan culture is its architecture. 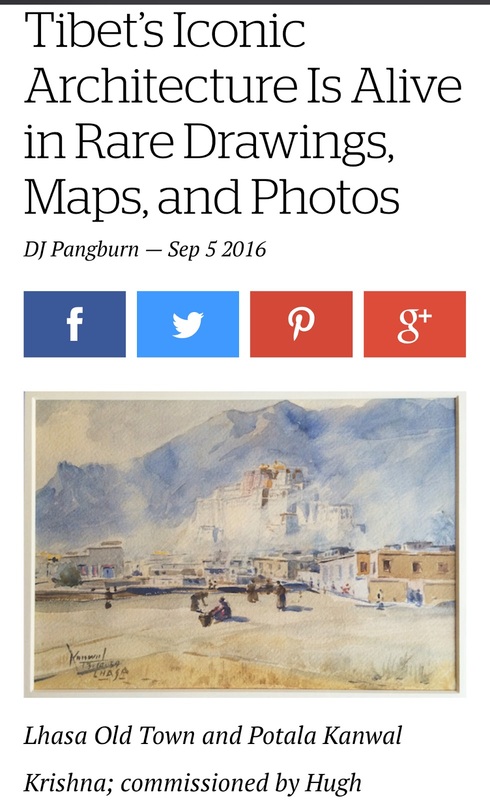 This fall at The Rubin Museum, visitors will be able to tour Tibet’s most celebrated architectural sites through both a historical and contemporary gaze. 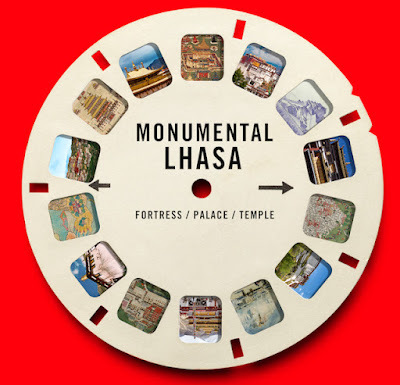 Titled Monumental Lhasa: Fortress, Palace, Temple, the exhibition features over 50 drawings, paintings, pilgrimage maps and photographs of monuments and sacred sites like Potala Palace, Jokhang Temple, and Samye monastery. These are sites influenced by Buddhist religious and historical narratives, instead of the West’s architectural tradition. Curator of the exhibition Natasha Kimmet says that when one visits Tibet and the Himalayas, one encounters buildings that form a distinctive part of the physical and visual landscape. When Kimmet began her curatorial fellowship at the Rubin nearly two years ago, her colleagues encouraged her to explore the museum’s architectural material, as aswell as photographs of monuments in other institutional collections. 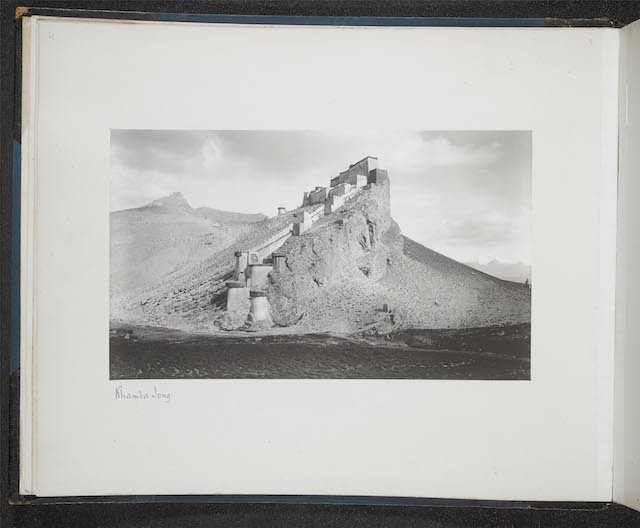 Through research and discussion Kimmetfound a rich body of architectural images focused on Tibet’s capital city, Lhasa. She also secured images on loan from public and private and public collections in North America and Europe, including many from the British Library in London. Portals Palace in Lhasa, a monumental structure that is the former seat of the Tibetan government and home of the Dalai Lamas (the former religious and temporal leaders of Tibet). 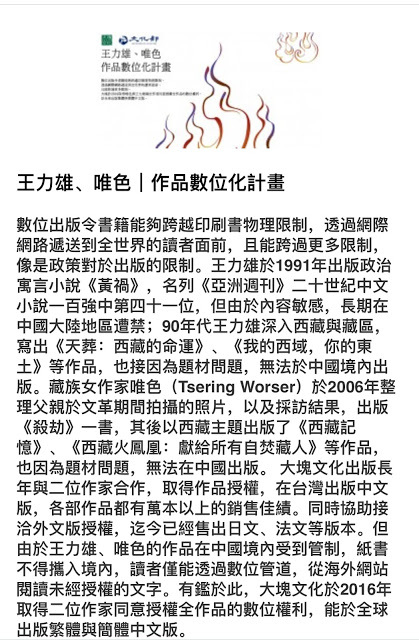 For this reason, Kimmet says that the palace is emblematic of Tibet. 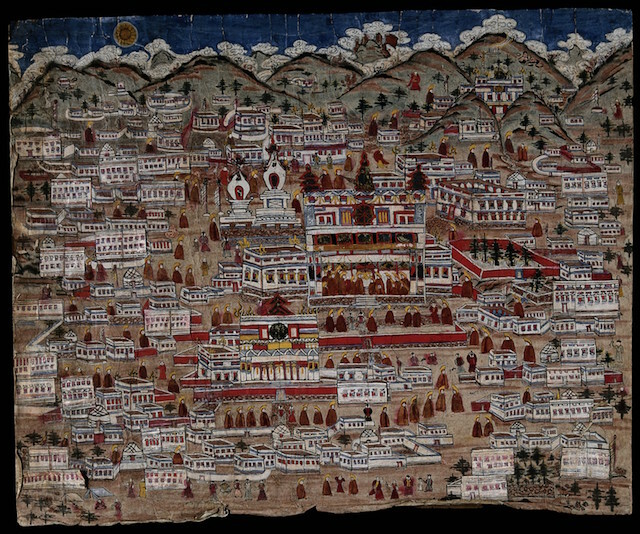 The Jokhang, located at Lhasa’s center, is Tibet’s most sacred temple, though it's less visually commanding as Potala. 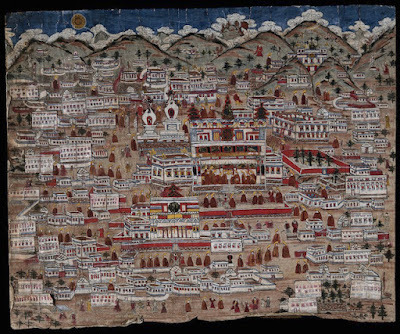 Kimmet says another iconic site is SamyeMonastery, the first monastery in Tibet. 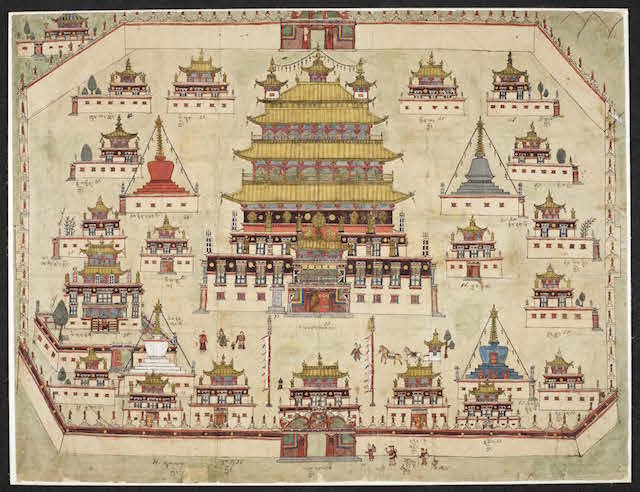 The structure’s layout itself is interesting because it presents a large mandala, the circular cosmic diagram used by Buddhists in visualization practices. Kimmet is also impressed by Tibet’s residential buildings, which she says reveal so much about how people structure their everyday lives. 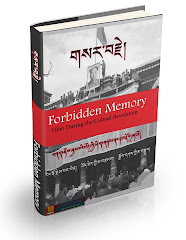 “Although many of Lhasa’s historical aristocratic residences have been destroyed since the mid-20th century, the Tibet Heritage Fund has carefully documented many of the buildings,” she says. Noble houses, according to the Tibetan Heritage Fund, were arranged hierarchically, with storage rooms on the ground floors, servant quarters and family chapel in the middle floor, and opulent living quarters with large bay windows for the landowner. 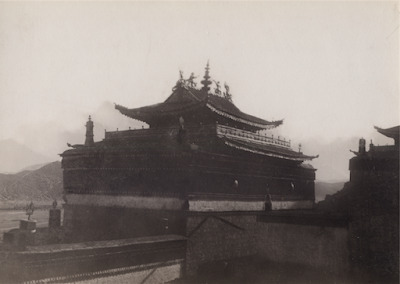 Courtyard houses were designed for itinerant traders that came in and out of Lhasa, while the single-family homes (Khang-pa) were built for craftsmen and retired officials, or even as summer homes for aristocrats. Samye Monastery. 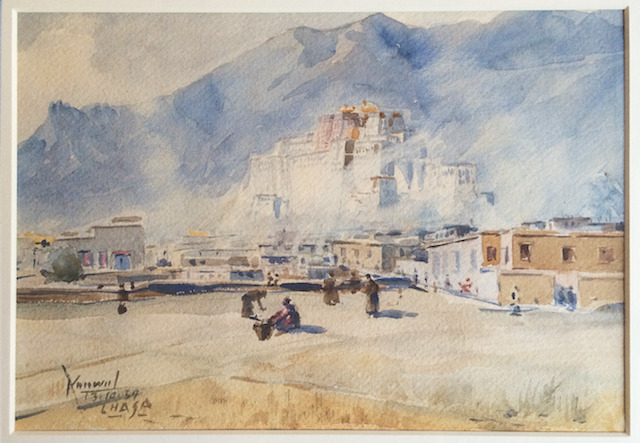 Painted by a Tibetan monk, commissioned by Major William Edmund Hay (1805-1879), Lahaul, present-day India, ca. 1857. Watercolor on paper. The British Library Wise Collection, Add.Or.3017, Folio 3 Photograph © The British Library Board. 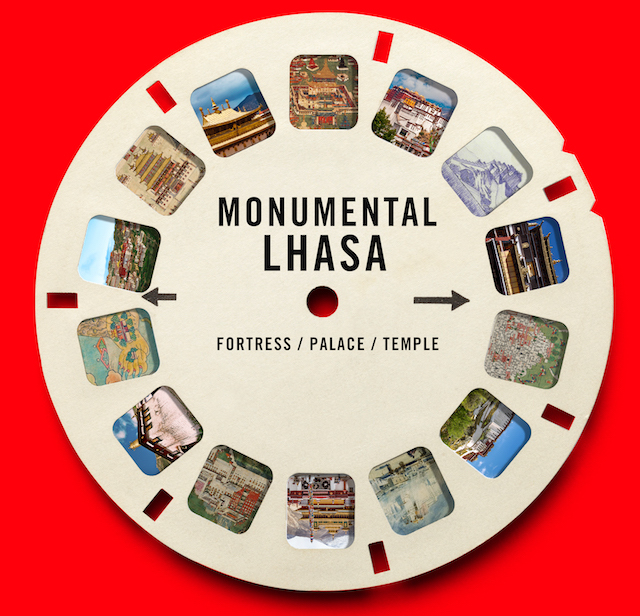 These basic construction features are common to all Tibetan buildings, says Kimmet, from the smallest single-room dwelling to the 13-story Potala Palace. 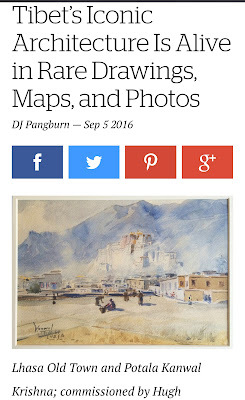 Interestingly, Kimmet says that artists and architects often remain anonymous in Tibet and the Himalayas. A master craftsman would typically be tasked with the design and construction of a Tibetan building, but they would consult with the inhabitants or patrons of the project. While nothing competes with actually visiting Tibet to experience the architecture, Kimmet says that the Rubin wants to bring its key architectural landmarks to a New York City audience that might not others have the opportunity to visit them. 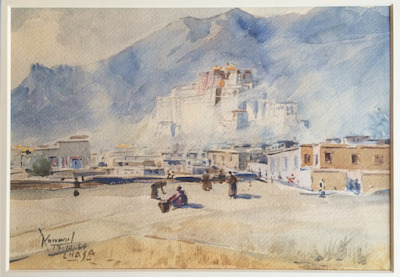 Though she hopes that audiences will come away with a new appreciation for Tibetan architecture, she would also like it if people see monuments in a new way.